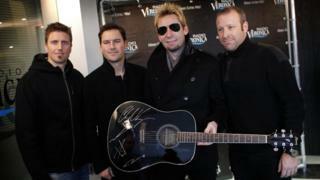 Image caption Nickelback as a punishment? A Canadian police force is threatening festive drink-drivers with a cruel and unusual punishment: forcing them to listen to local band Nickelback. Kensington Police Service, which looks after the residents of Prince Edward Island, will be handing out fines and criminal charges as usual. But it seems it is the possibility of having to listen to Nickelback which has really upset the locals. "Doesn't torture go against the Geneva Convention?" asked one on Facebook. The gift of Chad Kroeger? In recent years, the band has become a source of ridicule and hatred on the web - something the Kensington Police Service were apparently all too aware of when posting their annual advice to assign a designated driver before going out for the evening. However, conscious not everyone would heed the law, officers warned they would be out "looking for those dumb enough to feel they can drink and drive". Writing on Facebook, they continued: "And when we catch you, and we will catch you, on top of a hefty fine, a criminal charge and a year's driving suspension we will also provide you with a bonus gift of playing the offices [sic] copy of Nickelback in the cruiser on the way to jail. Image caption Kensington Police Service have described their new punishment as the "Christmas Bonus Edition"
"So please, lets not ruin a perfectly good unopened copy of Nickelback. You don't drink and drive and we won't make you listen to it." And in case people didn't quite get the message, they posted a picture of the offending item, still in its wrapping. The tongue-in-cheek post has divided the community, with some criticising Kensington Police Service for making light of a serious issue, while others hit out at them failing to support Canadian music. There were also those, however, who didn't feel they had hit quite the right note - and suggested there was another Canadian native who would work even better. "Don't hate on Nickelback!! They are a good band. Use someone like Justin Bieber. No one will ever think twice about drinking and driving if you use Bieber," the cheeky Facebook user argued.